Two Tone was the big hype of the late Seventies and early Eighties. Fronted by bands like the Specials, Madness and The Beat. 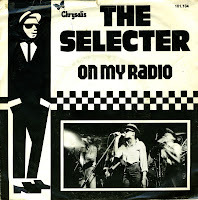 The Selecter was another band making music in this genre, which mixed elements of ska, punk rock, rocksteady, reggae and pop. The band consisted of Pauline Black, Compton Amanor, Charley Anderson, Charley 'H' Bembridge, Desmond Brown, Neol Davies and Arthur Hendrickson. Their first track appeared on the B-side of the Specials' hit song 'Gangsters'. Then they released 'On my radio' (1979), which became a top 10 hit in various countries. It peaked at number 8 in the UK and number 10 in the Netherlands. After this, they released several more singles, of which only one made the Dutch Top 40. They continued to have some success in the UK until the end of 1980. They reformed in 1991 to minimal success.